Parkview was using SharePoint Server 2007 as part of its organization’s productivity and collaboration platform for their employees. Unfortunately, they have come to realize that it is dated and disorganized. Also, the medical center had yet to effectively leverage the solution as the robust communications tool they had hoped for. Ultimately, they engaged with EPC Group because of our experience with the SharePoint platform (specifically SharePoint Online and Office 365), as well as our experience in the healthcare industry. In addition, we offered comprehensive user experience design services and mobile-responsive design capabilities. These hospitals users faced many usability challenges with their current intranet. For example, many felt that there were several key collaboration features missing. We were asked to create an intranet solution that was branded and streamlined regarding form and function. This would ultimately allow them to achieve better levels of communication and collaboration for hospital staff interactions. Our team spoke with a variety of stakeholders and staff members in engineering and human resources. We utilized this time to identify challenges and opportunities in design and how we could better understand Parkview’s Our team spoke with a variety of stakeholders and staff members in engineering and human resources. We utilized this time to identify challenges and opportunities in design and how we could better understand Parkview / MS Teams and Office 365. 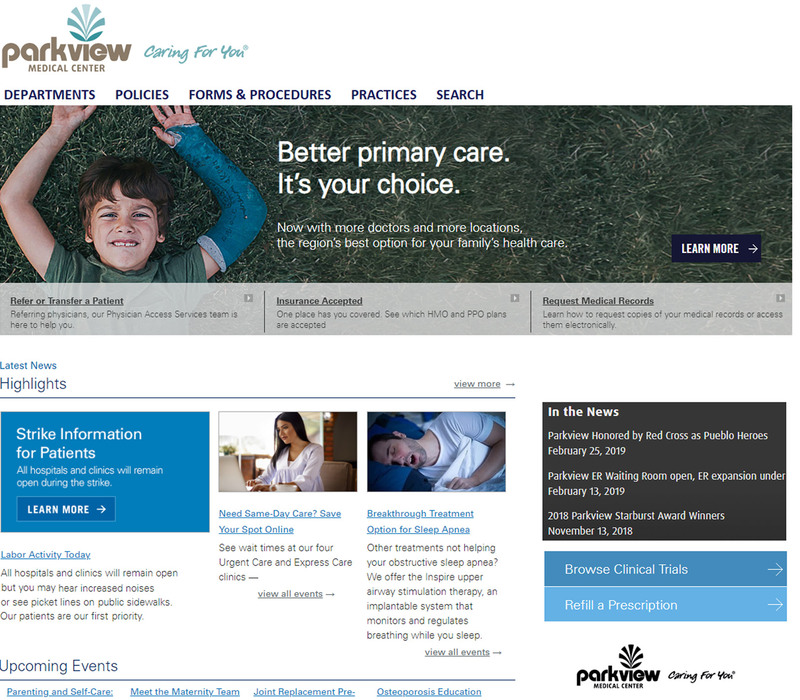 The outcome for Parkview Medical Center was an updated, intuitive intranet that provided a more personalized experience. Following the launch of this new collaboration solution, Parkview realized increased employee engagement with their intranet and overall collaboration across departments. They also achieved better overall consistency with how information is disseminated in regards to their communications team. In the future, we anticipate continued reduction in the number of support calls pertaining to how users locate what they are searching for in their intranet solution and a decreased reliance on email.